Heavy with kittens, Magtwilla made a choice. She’d been a housecat before, and she’d spent time being feral. Although she disliked the restrictive interference of the clothed primates, she had to admit that their houses with reliable food and warmth would be the better environment for a litter of kittens. So, Magtwilla selected a nice house and set about the work of charming the clothed primate who lived there. In mere days, the primate took her in, strapped an offensively pink collar around her throat, and took to calling her Jenny. Todd was laughably easy to manipulate with a simple purr. Magtwilla felt she’d done well by her unborn kittens. The litter of three was born in a cozy sock drawer. Warm, soft, and infinitely precious, the three tiny kittens gave meaning to a life that had previously been nothing more than a fight to survive. The clothed primate called her darlings Socks, Boots, and Mittens. Magtwilla appreciated his enthusiasm for his role of provider for her and the kittens, but his idea of a good name was terrible. Magtwilla gave each of her kittens a proper feline name in the traditional ceremony held when a kitten first opens her eyes. Twillatha was a gray tabby, just like the handsome tom who fathered her. Magtori was a calico girl like her mother. And Jenwilla was a solid gray who bonded almost instantly with the clothed primate. Magtwilla had to tolerate Todd holding her much more than she would have liked. Nonetheless, those early weeks of her litter’s kittenhood were the happiest of Magtwilla’s life. Twillatha, Magtori, and Jenwilla filled their mother’s heart with love and pride. Every day, she overflowed with purrs, watching her kittens stumble about, pouncing, playing, and learning the nature of their world. As the kittens grew steadier on their paws, Magtwilla began teaching them what they’d need to know to survive when they escaped from Todd’s house. Twillatha took to her mother’s teachings the best. She wiggled her tabby haunches like a pro and could track a single dust mote, falling through a shaft of sunlight, only to pounce on it perfectly as it hit the floor. Magtwilla would never have to worry about Twillatha being able to feed herself. She would be a natural huntress. Magtwilla didn’t worry about Magtori either. While the baby Calico showed less interest in hunting, preferring to stay cuddled close to her mother, a true mama’s little kitten, she was wise and cautious beyond her age. She listened closely with wide golden eyes — both to the lessons her mother told her and to the signs and tiny noises in the environment around her. Her ears constantly tracked the sounds of passing cars on the street outside Todd’s house, and the sound of Todd’s footsteps always sent Magtori darting to her mother’s side. Jenwilla, however, worried her mother greatly. It was as if she’d been born more domesticated than the others. She was too comfortable sleeping on cushions and eating dried pellets from ceramic bowls. She was too comfortable with Todd’s ungainly primate hands on her. And when Todd brought a group of clothed primates to visit them all, Jenwilla showed a bizarre and unnatural interest in them. Magtwilla didn’t know why, but it gave her stomach butterflies to watch her cloud-gray baby skitter and play for the visiting primates, batting at string and purring loudly when they petted her. She wanted to call her daughter away from them, but her own fear of the visitors kept her back. So, when they left Todd’s house, holding her daughter in their grabby primate hands, she was cowering in the corner, between the sofa and the wall. Magtori cuddled next to her. Twillatha was busy stalking a mouse that lived behind the refrigerator in the kitchen. When the front door opened again, Todd returned without the other primates. And without Jenwilla. Magtwilla cried out piteously, and she rushed to the front window, only to watch one of the primate’s mechanical monsters pull out of the driveway and drive away. She sat in the window all night, spurning Todd’s offers of tuna water. By the early hours of the morning, she felt haggard and hopeless. Unable to do anything to bring her Jenwilla back. She’d made a deal with the devil, and one of her three precious kittens was gone. Magtwilla spent the whole next day bathing her remaining kittens, against their strenuous dissents. As the soothing rhythm of washing their warm, struggling bodies, dragging her rough tongue over the soft napes of their necks, brought Magtwilla back to herself, she began to form a plan. It was time to escape. Whether her two kittens were ready for life outside or not, it was better than the risk she ran if they stayed. So, Magtwilla set about finding a way out of the house she’d adopted for her kittens’ nativity. Unfortunately, leaving Todd’s domicile turned out to be much harder than working her way into it. The windows and doors were all kept tight shut, except when Todd walked through the front one. She’d tried darting through the front door, but he always blocked her deftly with his feet. She’d never known of another primate who was so fastidious about keeping a cat inside its house! There were vents in the floor, but they were much too heavy for her to remove and their grates too fine to reach more than a single paw through. She tried all the cupboard doors, but they only led to cupboards. And when she tried clawing up the carpet around the edges of the room, the floor underneath was hard and solid. No escape there. Exhausted, Magtwilla vowed to explore behind the refrigerator after a decent night’s rest. If the invading mouse had found a way in, there must also be a way out. Hopefully, it would prove to be cat-sized. Not merely mouse-sized. The next day, though, was not soon enough. For Todd brought more clothed primates to visit them, including more of the boisterous short ones who moved in startling, jerky ways. Magtwilla spat at them, and Magtori followed suit. But one of the shortest primates dragged a piece of ribbon over the floor in a halting, stop-start fashion that completely charmed Twillatha. The tabby baby’s hunting instincts took over, and she pranced entrancingly for the primates. Magtwilla watched her second daughter’s goodbye dance in horror, presciently guessing what was coming this time. She steeled herself to attack the visiting primates, but Todd chased her and Magtori off before her claws found a solid, fleshly purchase. She heard them leave with Twillatha while she was still recovering in the next room. She didn’t wait in the window this time. Her first daughter had been gone for days. She knew that her second one wouldn’t return either. After many dark hours, while Magtori’s soft purring and beseeching gold eyes couldn’t console her, Magtwilla resolved that she would escape Todd’s prison of a home and find her daughters. Wherever the evil primates who took them had gone, Twillatha and Jenwilla must be findable. She was a good hunter. She would track the mechanical monsters that had borne her kittens away, and they would all be reunited. They would live a wholesome, righteous life in the wild, far from the primates who tempted with easy food and damnable cages. Magtwilla told Magtori her plan. Perhaps the kitten was too young to understand. Perhaps she was too used to the cushy life the devilish primates offered. Perhaps she was simply frightened by her mother’s frantic demeanor and bored by a long morning of searching for a seemingly non-existent mouse hole behind the refrigerator. Truth be told, Magtori wasn’t even sure that the mythical creatures that her mother called ‘mice,’ and her missing sister pretended to stalk, even existed. She did know that the old lady who Todd brought to visit her smelled pleasantly of milk and fresh bread. This older primate moved slowly and steadily, unlike the younger ones, and Magtori was drawn to her long white hair. The silvery strands escaped from a waist-length braid in a way that intrigued Magtori. She felt drawn to approach the older lady and touch that braid, gently, with a claw-sheathed paw. It was love at first sight, between Magtori the shy baby Calico and this woman who’d come to visit her. As pure a love as ever forms between cat and human. Magtwilla watched it happen, helpless to affect it. She sat on the floor, in the middle of the room, too numb to hide. She’d brought her kittens to this house to protect them. She’d chosen to raise them in a place where they’d be safe and warm, and she had kept their bodies safe. Yet, the insidious nature of the primates had wormed its way into her kittens’ hearts and minds. She had lost them as surely now as if all three had died in the cold. Todd returned from walking the demon-shaped-like-a-harmless-old-woman out with Magtori, and he scritched Magtwilla behind the ear. Magtwilla miaowed, a hollow sound, filled with sadness. The human who had entrapped her didn’t understand its meaning, but the mouse who lived behind the refrigerator was watching. And he did. As the hours progressed to days, the mouse watched Magtwilla begin to waste away. She sat in the window dreaming of her kittens. She wouldn’t touch the food Todd brought her. The mouse feared Magtwilla, but his stomach was empty and a poorly-healed broken paw kept him from returning outdoors. The more food he’d stolen, the more careful Todd had become with his pantry. Now all the food was locked up tight, except for the bowl of milk and fish that perennially sat before the fading cat who disdained it. Tiny brown eyes cautiously watched wide golden ones as the mouse began to dare approaching his natural predator. With each step, his heart beat faster, and his paws quivered worse. When the gold eyes finally turned and saw him, the mouse froze. But Magtwilla did not attack. She didn’t raise a paw to strike him, and his hunger slowly conquered his fear. The small brown body crept up to Magtwilla’s bowl. He placed his paws on the edge, and he stared into eyes that had spent days searching for something they would never find. 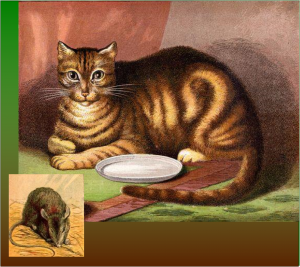 The brown mouse was nothing like her kittens, and, yet, he was small and soft and warm. “Are you a kitten?” she miaowed. Magtwilla tilted her head, skewing her left ear to the side. She knew the mouse wasn’t her kitten. Or a kitten at all. At least, certainly not a healthy, beautiful one. She remembered Twillatha hunting this very rodent, and, somehow, that connection to her kittens was enough. Magtwilla stretched out, relaxing for the first time since Magtori left. If this deformed rodent of a kitten meant to be hers, then it would need bathing. The mouse thought he would die of fear as Magtwilla’s sharp tooth-filled mouth approached him, but it was a warm, rough tongue that he felt. Not the points of her teeth. She bathed him thoroughly, and watched him eat. When he’d had his fill, before the mouse could skitter away, Magtwilla bit him gently at the nape of his neck. She carried him with her mouth to her favorite sock drawer where she performed the secret ceremony for naming a new kitten. This was a kitten she could keep hidden from Todd. This was a kitten she could keep. And as they slept together, predator and prey side-by-side, the mouse willed his heart to stop racing. This dangerous foster mother could eat him whole in one bite, if her heart ever healed and she regained her mind. However, she could keep his belly full of good food until then, and he didn’t mind her calling him Twilltori. Even if it wasn’t his true name.